Machine Learning Services in SQL Server eliminates the need for data movement - you can install and run R/Python packages to build Deep Learning and AI applications on data in SQL Server. Did you know that you can write R and Python code within your T-SQL statements? 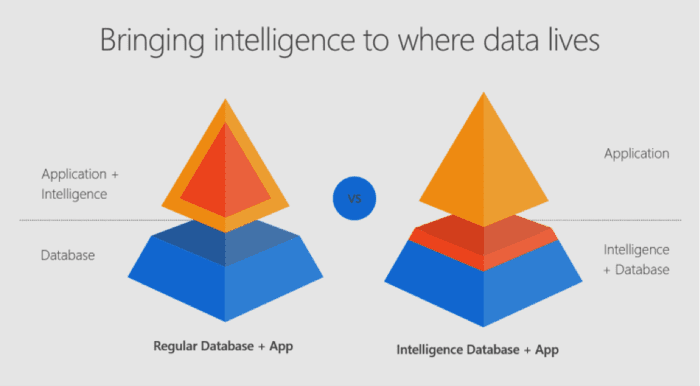 Machine Learning Services in SQL Server eliminates the need for data movement. Instead of transferring large and sensitive data over the network or losing accuracy with sample csv files, you can have your R/Python code execute within your database. Easily deploy your R/Python code with SQL stored procedures making them accessible in your ETL processes or to any application. Train and store machine learning models in your database bringing intelligence to where your data lives. You can install and run any of the latest open source R/Python packages to build Deep Learning and AI applications on large amounts of data in SQL Server. We also offer leading edge, high-performance algorithms in Microsoft's RevoScaleR and RevoScalePy APIs. Using these with the latest innovations in the open source world allows you to bring unparalleled selection, performance, and scale to your applications. Sp_execute_external_script is a special system stored procedure that enables R and Python execution in SQL Server. There is a "language" parameter that allows us to choose between Python and R. There is a "script" parameter where we can paste R or Python code. If you do not see an output print 7, go back and review the setup steps in this article. Machine Learning Services provides more natural communications between SQL and R/Python with an input data parameter that accepts any SQL query. The input parameter name is called "input_data_1". As you executed these examples, you might have noticed that they each return a result with "(No column name)"? You can specify a name for the columns that are returned by adding the WITH RESULT SETS clause to the end of the statement which is a comma separated list of columns and their datatypes. You now know the basics to execute Python in T-SQL! Check out the SQL Server Machine Learning Services documentation page for more documentation, samples, and solutions. Check out these E2E tutorials on github as well. Would love to hear from you! Leave a comment below to ask a question, or start a discussion! Which Database is best for an Analyst?